Your Daily Cute: Meet Flea... The Kitty Who Started it All! Today I want you all to meet a very special kitty. Her name is Flea. I'm not sure why I named her Flea... she didn't even have any, it just sounded like a cute kitty name. Flea used to live outside my parents house. I saw her for the first time when I was over for dinner one night right after one of the Florida hurricanes of 2004. She was hiding behind a tree, looking all scared and timid. She may have gotten lost during the storm... we'll never know. Being the Mother Nature animal-loving person that I am, I started to go up to her, crouching real low and slowly approaching her with my hand out so she wouldn't freak out. I can't remember if she did come out that night, but over the next few months, she became more friendly and basically a neighborhood pet. My parents fed her and so did their neighbors. Everyone loved her! And everyone knew this little girl needed a real home. So when me and the boyfriend I had at the time broke up (and he lost Pimp as a son, poor guy! ), I naturally suggested he take Flea as own -- and he said yes! Flea and her daddy, Tim. Yay! 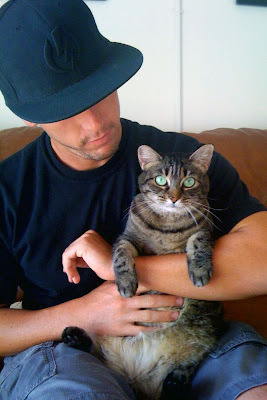 Flea got a home and a great daddy, and he got a great kitty. He's the best with cats. He's still one of my best friends and the one I trust to babysit Pimp and Moo if I ever go away. Pimp LOVES him. She was scared at first, and not too friendly, but with lots of love, she came around. That was 2004. I just visited them a couple nights ago... and she has become the most friendly cat ever! She is ALL love. She purrs and talks and jumps on your lap and everything. What a lucky kitty! I'm so glad I could get her a home. And that, Cuteheads, is officially where all my crazy-cat-lady stuff started. Flea is the first kitty I've ever helped, and since then I've lost track of how many cats I've either found homes for, helped find homes for or fed because simply showed up at my door or near my car. Flea gave me the cat-lady bug (hehe, get it? ), and I've loved every moment since! Sweet story! They do find a way into our hearts! Awww such a nice story. Flea is a bootiful girl. OMC what beautiful green eyes Flea has. Thanks for telling us the wonderful Story of Flea. It's a great one and I'm so glad to know she has such a good daddy. Oh what a sweetheart little Flea is!! Love the name "Flea" that is adorable! 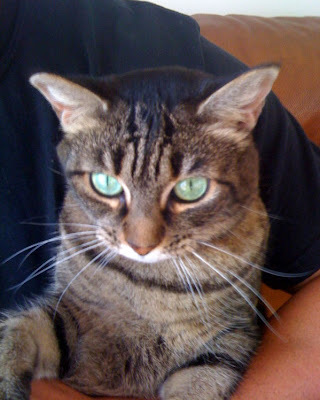 Yes she does have gorgeous green eyes!!! What a precious kitty, thanks for sharing your story! What a great story. That is so neat that Tim took Flea and that she has blossomed. Thank heavens you made friends with her. She is a very pretty kitty too. Good job both you and Tim. I'm so happy for Flea. Too many never find a home. Good for you for going the extra mile for Flea. I will always remember the night Flea Flea and I shared a pillow. What a good girl. Thank you so much for helping Flea and so many other cats! (Many thanks to Tim too for being such a great cat dad.) The cats are sending you many many purrs. She's definitely a pretty kitty and I love the way she looks straight at you. That was a wonderful rescue story, thanks for sharing it and please tell Flea she made all of our whiskers grin up! I can totally see how Flea would start anyone on the road to helping other kitties! She is a very sweet looking girl! What a cutie Flea is!! We are the "parents' neighbors!" 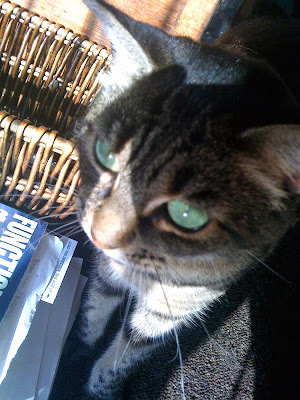 We remember Flea (although we called her "Ethel" when she was dining at our house!) She was sweet and loveable and so happy she got a real home, thanks to The Cat-Lady and Tim. Ok,First off you are a wonderful person! Second off, How do you come up with these clever names? I work at a vet clinic & I know we don't have a Flea or pimp in our system! How come I can never think of a name like that when I need it? Thank you for the heartwarming story. You rock! She's sooo pretty! 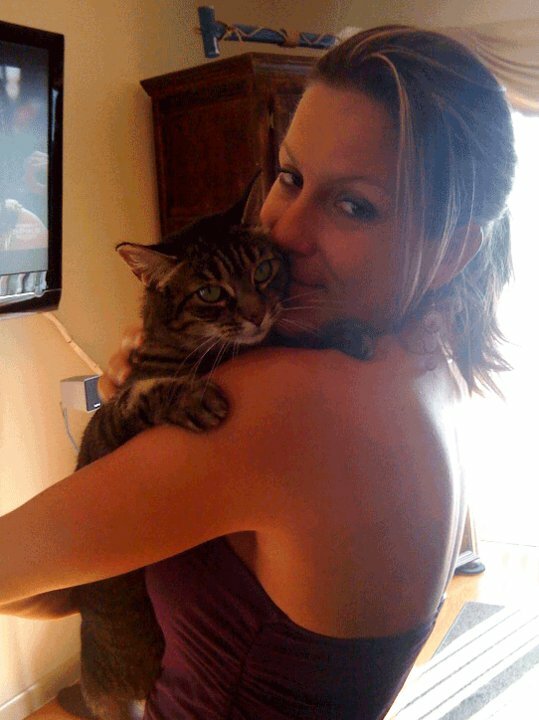 I adore Tabby kitties!